The whole project may turn out to be one big disappointment—or worse, a full-on scam. China’s futuristic straddling bus was an idea that sounded straight out of a science fiction novel. It seemed too good to be true. And, as it turns out, it may be. Just days after its high-profile unveiling in the northeastern city of Qinghaungdao—quashing doubts that the project would ever get off the ground—the bus (or train, as some have argued) seems to have driven right into a ditch of dashed hopes. For years, it existed only on paper and tiny models, but on Tuesday, the bus went for its first test drive. 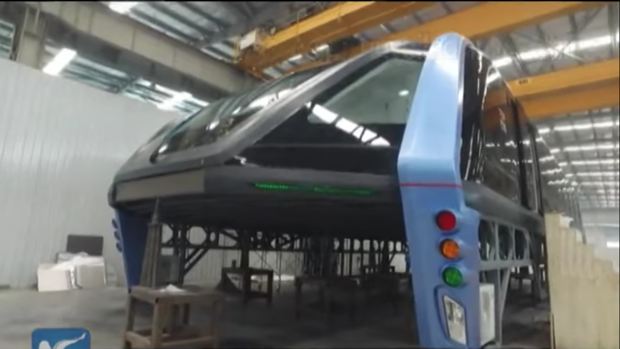 Shanghaiist reports that the 72-foot-long straddling bus has been locked up, and all further testing postponed amid allegations by local media outlet Global Times that the project was illegally funded—and that it may have all been a big scam. Designer Song Yuzhou has refuted these claims, saying his company hasn’t done anything wrong. It was always clear that the far-out design of the bus was going to invite questions about its feasibility: How can cars maneuver safely under the bus to change lanes or make a turn? With only 7 feet of clearance underneath, what happens when a 13-foot-tall truck needs to pass through? Both Wired and Beijing Daily have also pointed out issues with maintenance costs, re-charging requirements (it runs on electricity), and the weight of both the vehicle itself and the 1,400 passengers it can carry. Essentially, that’s what the road test was supposed to be for: To investigate these concerns, and either scrap the project or introduce design revisions. But things didn’t get that far. More serious concerns face the Transport Explore Bus company. The editorial in Global Times also alleges that the project is a scam, funded through what’s called peer-to-peer (P2P) financing, which the Chinese government has recently begun cracking down on as a Ponzi scheme. In fact, when journalists from Xinhua News Agency—the state outlet that first reported the attention-grabbing unveiling—went to visit a proposed factory for building the bus, all they found was a giant hole.